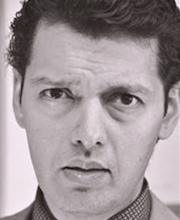 Sagar Arya is an actor and voice-over artist from India. His television credits include Endeavour, Rillington Place, Cucumber, Lewis, A Touch of Frost, Hunted, Spooks, Casualty and Holby City. He appeared as Claudio in RSC’s Much Ado About Nothing, as well as Twelfth Night (West End), The Great Game (Tricycle) and A Fine Balance (Hampstead). He has also recorded a number of audiobooks including An Era of Darkness and The Sialkot Saga.